We could be on the verge of an energy crisis… Oil just hit $100 a barrel (a combination of increased world-wide demand, and the declining value of the US Dollar I believe) so alternative energy sources are becoming more and more important. Solar seems like a no-brainer to me. We have all of this energy bombarding us every day, and it’s a shame that we don’t capture more of it. The SunTable looks like a cool concept for a small patio or deck. 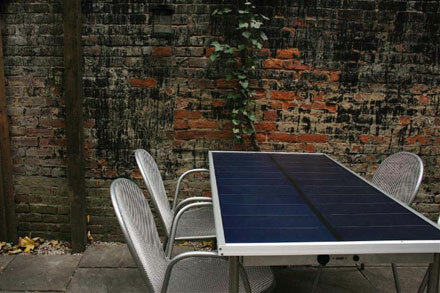 There’s certainly no shortage of solar panels of various shapes and sizes that’ll let you charge and use your various gadgets outdoors, but those looking for a slightly more permanent solution now have a new option to consider courtesy of the folks at Sudia Design Labs, which recently introduced its appropriately-named SunTable. In addition to comfortably sitting six people, it’s able to provide up to 150 watts of power and recharge fully in just three hours of direct sunlight. To make use of all that juice, the table also comes with an inverter to let you plug in a laptop or other device and, naturally, it includes some LEDs to inform you of its status. As you might have guessed, however, that convenience comes at quite a cost ($3,600), and you’ll have to act fast, as there’s only fifty of the tables up for grabs, with ’em set to start shipping on March 15th. Price is a bit prohibitive for all but the wealthy right now, but solar panel efficiency and product is getting better all the time, so I hope that some day soon this concept will be only marginally more expensive than a standard table. To move the discussion a bit broader, I have been wondering about solar power generation a lot lately. The sun sends this energy to the planet constantly, and a solar panel can grab some of it and turn it into power. However, considering the law of conservation of energy, would this affect the environment at all? It seems that less energy would be reflected back into our atmosphere, into space, or into the ground. Are solar panels just at a scale small enough that the environment would never be affected?